The Upholder/Victoria-class submarines, also known as the Type 2400 (due to their displacement of 2,400 tonnes), are diesel-electric fleet submarines designed in the UK in the late 1970s to supplement the Royal Navy's nuclear submarine force. They were decommissioned with the end of the Cold War after a short length of service in the Royal Navy. In 1998, Canada purchased the submarines and a suite of trainers from the Royal Navy to replace the decommissioned Oberon class of submarines. The Royal Navy was going to follow the Oberons with nuclear-powered boats but there was still a role for diesel powered boats, as demonstrated by activities during the Falklands War, and they could be built faster than nuclear submarines. The only yard building nuclear submarines was Vickers at Barrow-in-Furness and it was occupied with the Vanguard-class ballistic missile submarines. Accordingly, to provide the Royal Navy with a diesel boat for the Greenland-Iceland-UK Gap, Vickers Shipbuilding and Engineering Ltd developed the Upholder class from the 1970s onwards. The design was based on their private scheme for a 2400 tonne submarine for export sales. This was combined with lessons learnt from the Oberons and the design of the Trafalgar-class fleet submarines. They were built with teardrop hulls and the fin was built from glass fibre to keep weight down. The submarines have technology generally found only on nuclear-powered submarines and at the time (1992) were widely regarded as being among the best diesel-electric submarines in the world. The price of each submarine was published at US$215 million, but actual cost after correcting the design flaws was higher. As in most new submarine classes, the emphasis was placed on standardisation and automation to reduce manning requirements. The first of the class (Upholder) was ordered in November 1983 and completed in 1990, and there followed three more boats (Unseen, Ursula and Unicorn) ordered in 1986 and completed in 1991-1993. The Royal Navy had planned to order 12 of the class, but this was trimmed first to 10 and then to nine before being curtailed at four as part of the "peace dividend" at the end of the Cold War in the early 1990s. The submarines entered service from 1990 to 1993. Initially they were unable to fire torpedoes and the first three were refitted in 1992 and 1993 to have this fixed at a cost of £9 million. They were operating from HMS Dolphin (at Gosport) but with only four submarines the base was deemed uneconomic and they transferred to Devonport Naval Base. In their short period in service, the class operated mostly in the Atlantic Ocean, the Mediterranean and UK waters. The exception was Unicorn, which completed a 6-month deployment east of Suez completing operations and exercises in the Mediterranean, the Gulf of Oman and Indian Ocean and in the Persian Gulf. 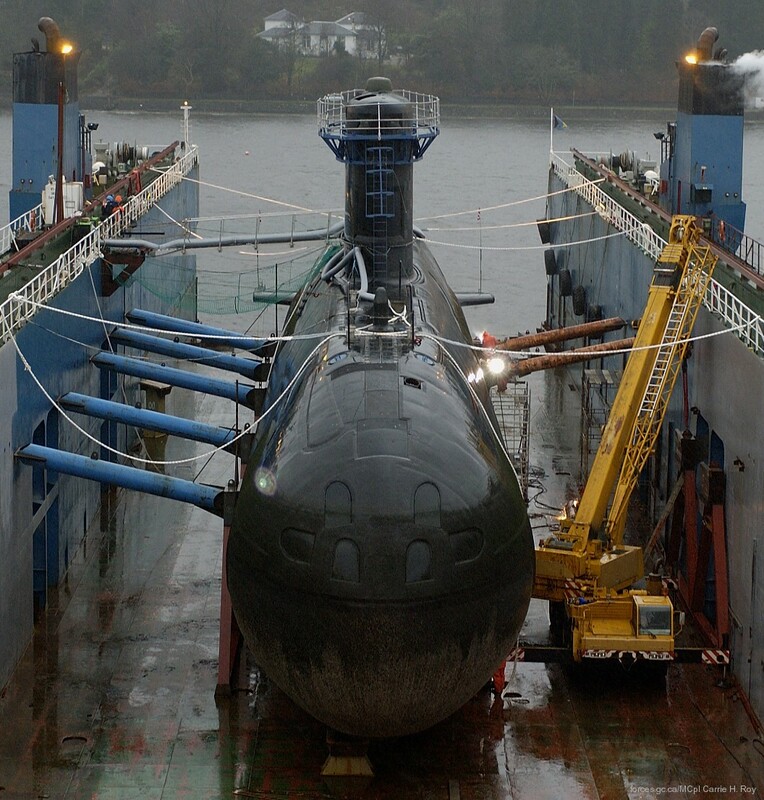 Her return in October 1994 to decommission marked the end of service of this class, following a defence review by the UK government that decided to maintain an all-nuclear-powered submarine fleet rather than a mix of diesel with fewer nuclear submarines. In 1998, Canada accepted the four Upholders as replacements for their old Oberons; initially with one to operate in the Pacific fleet and three in the Atlantic, but later two boats were assigned to the Pacific. After all four subs were obtained by the Canadian Navy, the Canadian Forces renamed them as the Victoria class. The first of class, Victoria, was commissioned in Halifax in December 2000, Windsor in June 2003, Corner Brook in March 2003, and Chicoutimi in September 2004. The boats are named after Canadian port cities. Victoria and Chicoutimi operate out of CFB Esquimalt, British Columbia as part of the Maritime Forces Pacific (MARPAC) fleet in the Pacific Ocean, while the remaining boats are based at CFB Halifax, Nova Scotia and operate in the Maritime Forces Atlantic (MARLANT) Fleet within the Atlantic and Arctic oceans. 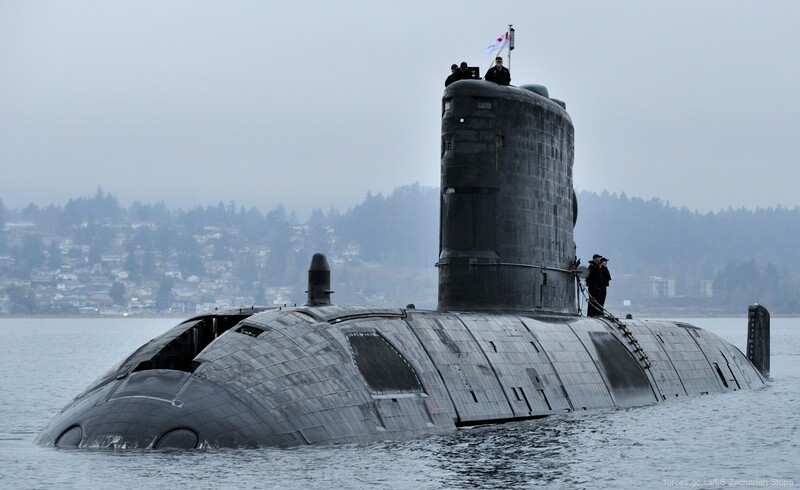 Although the Canadian government touted the $750 million CAD procurement as a bargain, there have been arguments over the quality of the submarines with some suggestions that the purchase price will be at least spent again putting things right. Canadian opposition parties are demanding that the British government fund any further costs, since it is widely believed that the submarines deteriorated while in storage and the Royal Navy was not completely forthcoming on their condition during the sale. Stephen Saunders, editor of Jane's Fighting Ships, argued that "there is not something inherently wrong with the class of submarines." On October 5, 2004 HMCS Chicoutimi, sailing from Faslane Naval Base, Scotland to Nova Scotia, declared an emergency north-west of Ireland following a fire on board. The fire was caused by seawater entering through open hatches in rough seas. It soaked electrical insulation which had not been sufficiently waterproofed (since it conformed to an older specification than the three other submarines), starting a fire. Chicoutimi lost power and was rescued by Royal Navy frigates Montrose and Marlborough on October 6. Lt(N) Chris Saunders died subsequently from the effects of smoke inhalation; due to the rough weather it had not been possible to airlift him and the other casualties to a hospital until two days later. Chicoutimi was later transported to Halifax for repair. A board of inquiry cleared the captain of any fault but the regulations permitting the submarine to run on the surface with open hatches are being revised. Nomination for the L-3 MAPPS Saunders Memorial Award, which was named in Lt(N) Chris Saunders` memory, is determined through peer selection and instructor evaluation and the overall winner best epitomizes the qualities evoked by the award motto: Professional Excellence in Marine Systems Engineering and Training. Following claims made in the Canadian media about the cause of the fire, blaming the UK for supplying an unsafe vessel, the situation was exacerbated by comments made by Secretary of State for Defence Geoff Hoon. He accompanied his condolences for Saunders with a proposal that the Royal Navy would charge Canada for the cost of the rescue while also stating that Canada as the buyer had to beware. In Canada, many World War II veterans were outraged by his comments. Despite all the media speculation, the accident was later decided to be due to an error in operational procedure. In 2015, the Royal Canadian Navy commenced the life cycle extension program expected to extend the lives of the submarines by 6–18 years. Among the systems refitted will be the electronic intelligence gathering systems. The program is expected to cost between $1.5 to $3 billion. The actual work on the submarines would begin in 2020. The boats were designed and built by Vickers Shipbuilding and Engineering Ltd for the Royal Navy and are essentially identical to modern nuclear submarines (with the distinctive Albacore-derived teardrop hull and sonar-absorbing tiles) but run on diesel engines instead of nuclear reactors. These were Britain's first conventional submarines to feature the tear-drop shape, which greatly reduced the acoustic signature produced by the boat while cruising. The boats were designed with advanced noise-attenuation features to reduce the radiated noise levels below those of the already very quiet Oberon class. There was also a reduction in the snort (snorkel) time required to recharge the batteries to ensure a minimum exposure time of any part of the masts above the water. The design included an updated version of the fire-control system being installed on the nuclear-powered submarines under construction at the time, designed to reduce stability problems at torpedo launch, a state-of-the-art French passive sonar system, the then-current towed array, and a passive ranging set. A large double-armature motor is powered by a 9000-ampere-hour battery or a pair of Paxman Valenta diesel engines. Slow patrolling would require only 30 to 60 minutes of snorkeling per day; an 8 knots (15 km/h; 9.2 mph) transit would require snorkeling 30% of the time. Top speed matches any comparable diesel-electric submarine class - such as the Scorpène-class submarine – and can be sustained for 90 minutes. During construction of the first boats it was recognized that the weapon-discharge system design had flaws. The torpedo tube slide valve controlling operation of the torpedo tube doors could have, under certain system failure conditions, allowed the opening of the inner door while the outer door was open. The flaw was fixed in the first three boats and the modifications included in the fourth boat while still under construction. Miscalculations were made in the design of the main-motor control circuitry. During the sea trials of Upholder, when performing the specified trial for an emergency reversal ("crash back"), a flash-over incident occurred, which resulted in the complete loss of all power and propulsion. On investigation, this was traced to a fault in the design of the control circuitry insulation, resulting in a battery short circuit current of more than 60,000 amperes. The diesels were originally designed for use in railway locomotives, and were not intended to be rapidly stopped and started. Shutting them down after snorkelling led to many failures. Similarly, the motor-generators were operated at full power for longer than expected, and consumed brushes and filters rapidly (the brush problems were not specific to the Upholders, and were a widespread issue on all RN vessels at that time). Acceptance of the class into service was delayed for three years, partly due to the programme being scaled back by the Ministry of Defence, while such problems were corrected. The result of those corrections, however, is an extremely capable design. When operating on battery power, Upholders are almost undetectable on passive sonar, and when snorkelling, their acoustic signature is comparable to their nuclear-powered contemporaries in normal operation. They are physically small, and thus difficult to detect by magnetic anomaly or other non-acoustic means. A local area network was built into the Upholders, supporting most of the sensors and fire-control systems, including remote viewing through the periscopes using both low-light television and infrared, an unmanned helm, and direct control of the main motor from the conn. The boat can fight with a team of four in the sonar room and a conn team of eight. Fire-suppression in unmanned compartments can be initiated remotely, and watch-keeping logs are automatically recorded. In port, the boats can be electronically linked such that one duty watchstander can monitor several submarines. The submarine has a single skin hull constructed of NQ1 high tensile steel. The outer side of the submarine's hull, casing and fin is fitted with about 22,000 elastomeric acoustic tiles to reduce the submarine's acoustic signature. The hull is 70.3 metres (230 ft 8 in) in length by 7.6 metres (24 ft 11 in) in width and with a depth of hull of 5.5 metres (18 ft 1 in). The fin or main sail houses a five-man lockout chamber. The submarine's escape and rescue system has been extensively upgraded with additional stowage space for escape stores and an underwater telephone to meet the Canadian Maritime Force requirements. 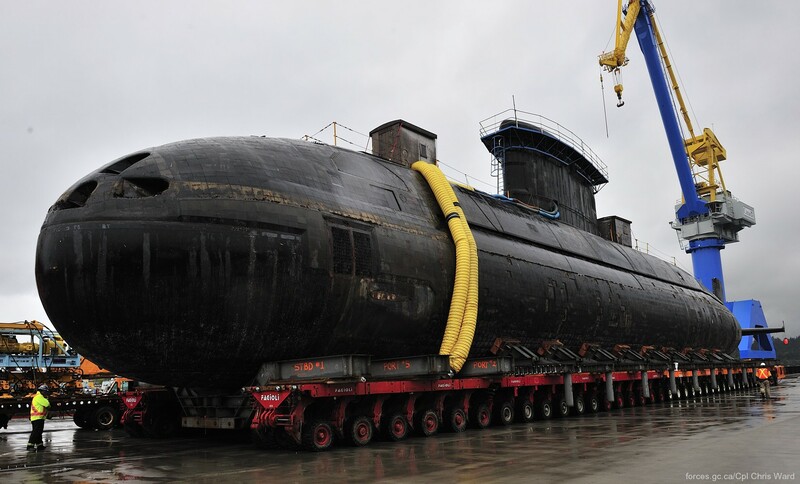 The hull displacement is 2,168 t surfaced and 2,455 t dived. The submarine accommodates a crew of 48 including seven officers. There is room for an additional five mission crew, observers or training crew. The submarine has six 533 mm (21 in) bow torpedo tubes equipped with two air-turbine pump discharge systems. The tubes could be used for Marconi Tigerfish Mk 24 Mod 2 or Spearfish torpedoes. Sub-Harpoon missiles or mines could be used in place of torpedoes. The DCC Action Information Organisation and Fire Control System (AIS/FC), developed from the DCA/DCB systems in service at that time aboard Royal Navy SSN's, was based on two Ferranti FM1600E computers with a digital data bus linked to three dual-purpose consoles. Up to 35 targets could be tracked, and automatic guidance could be provided for four torpedoes against four separate targets. In Canadian service, the Sub-Harpoon missile firing and mine-laying capabilities have been removed. The torpedo room or weapons storage compartment houses racks for storing up to 18 Gould Mk 48 Mod 4 torpedoes. The torpedoes, operating at 40 knots (74 km/h) speed, are deployed against targets over a range of 50 kilometres (31 mi). The torpedo range is 38 kilometres (24 mi) at speeds up to 55 knots (102 km/h). The torpedoes use active and passive homing to approach the designated target. In 2014, the Government of Canada purchased 12 upgrade kits that will allow the submarines to fire the Mk 48 Mod 7AT torpedoes. Lockheed Martin Canada, Lockheed Martin Undersea Systems and Northstar Technical upgraded and installed the submarine's Lockheed Martin Librascope Submarine Fire-control system (SFCS) to meet the operational requirements of the Canadian Navy. Components from the fire control system of the Oberon-class submarines were installed. A UHF DAMA satellite communications system has also been fitted. The Victoria-class submarines are equipped with the CK035 electro-optical search periscope and the CH085 optronic attack periscope, supplied by Thales Optronics. The CK035 search periscope incorporates a binocular multiple field-of-view (FOV) optical system with an optical target ranging system. The CH085 attack periscope incorporates a binocular optical system, a reduced above-water signature, an infrared thermal system and an image intensifying system. These periscopes are used primarily for submarine safety watch-keeping, surveillance and attacks on surface targets. The submarine's long range sonars are the Thales Underwater Systems Type 2007 flank array sonar and the Thales Underwater Systems Type 2046 towed array sonar, both operating in passive mode and low frequency for long range detection and location. The Canadian Towed Array Sonar (CANTASS) has been integrated into the towed sonar suite. The Thales Underwater Systems Type 2040 hull mounted sonar installed in the bow is a passive search and intercept sonar operating at medium frequency for optimum medium range performance. The navigation suite includes a Global Positioning System, and a Kelvin Hughes Type 1007 and a Furuno portable navigation radar both operating within the I-band frequency range. Northrop Grumman Sperry Marine was awarded a contract in February 2005 to provide the Mk 49 inertial navigation system, based on ring laser gyroscope technology. The boat is fitted with two submerged signal ejectors (SSE), small vertical discharge tubes which can launch either acoustic or bubble decoys. The passive antenna of the Condor Systems Sea Search II Electronic Support Measures (ESM) unit is fitted to the top of the CK35 Search Periscope. The submarines are fitted with a diesel-electric propulsion system driving a single shaft, based on two Paxman Valenta 16SZ diesel engines each rated at 2.7 MW (3,600 hp) sustained power with two 2.8MW Alsthom alternators and an Alsthom motor rated at 4MW. The propulsion and power systems are controlled from the Machinery Control Console (MCC) in the Motor Room. For operation under ice, the Victoria-class submarines could be fitted with an air-independent propulsion system. The installation of an air-independent propulsion system might be considered in a future refit or upgrade program. The surface speed is 12 knots (22 km/h) and the submerged speed is in excess of 20 knots (37 km/h). In snorkeling mode, travelling at low speed at periscope depth using an extendable air-breathing system, the submarine can continue at up to 12 knots (22 km/h). The range at an 8 knots (15 km/h) snorkeling speed is 8,000 miles (13,000 km). The submarine has a patrol endurance of 56 days.